Can you imagine the day when this is a common scene around Earth? 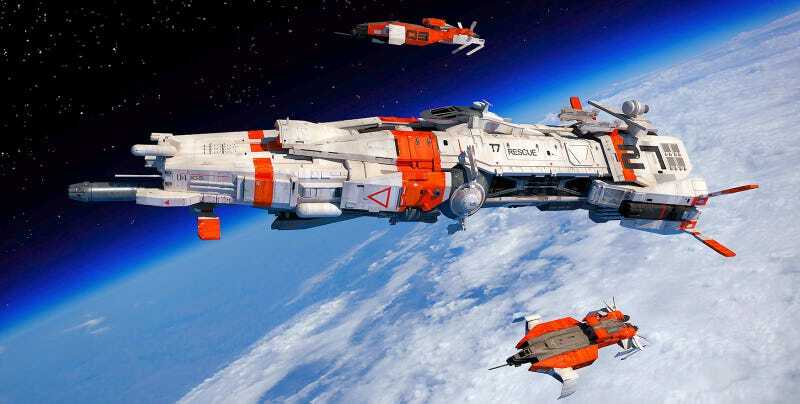 "The Patrol cutter Hercules and two rescue boats over Nu Sera," reads the caption by concept designer Isaac Hannaford. I really like Isaac's work because the design and the finish is not only beautiful—it feels solid. I see the above image and it seems as real as NASA photo of the space solid. In fact, I wish there was a game as solid as his work. A game that is not over the top action. Something understated that could even be a bit boring at times, with True Detective-style slow story development. Atmospheric, solid. Something that my brain could buy as real. The far future of NASA and human space exploration, with a dash of good action. Realistic action. At least as realistic as Gravity. I just want to put on an Oculus Rift and be teleported to Isaac's awesoe scenes. Isaac Hannaford has been working in the games industry for nine years, doing design work for Halo 3, Halo 3: ODST, Halo: Reach, and Destiny, among others. You can follow his work at his personal website.